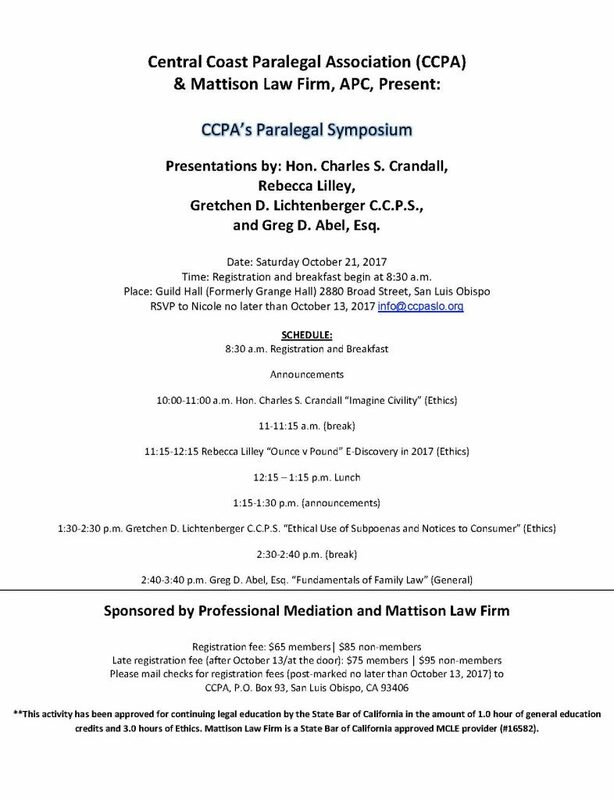 The Central Coast Paralegal Association’s Annual MCLE Symposium will provide an opportunity to earn four units of MCLE credits, including three units of ethics credits, by attending four dynamic presentations. Presenters are Hon. Charles S. Crandall, Judge of the San Luis Obispo County Superior Court; local attorney Gregory Abel of Wendt & Abel; paralegal Rebecca Lilley, owner of Axis Paralegal; and process server Gretchen Lichtenberger, owner of You’ve Been Served. Breakfast, lunch and networking opportunities included. See the schedule below. Tickets are available through eventbrite.com. The Central Coast Paralegal Association (CCPA) is a member of the California Alliance of Paralegal Associations (CAPA) and is comprised of professional paralegals, students and supporting members of the legal profession. CCPA strives to provide excellent educational opportunities to advance and promote the paralegal profession on the Central Coast.